Home → Forums → 3ds-max → General-scripting → Noob for loop help! I'm hoping some one can help... I'm attempting my first max script, so excuse my ignorance! I would like the script to create a hair that grows from an object... I have achieved this. What I would like to now do is use a for loop so it can repeat that operation with random seeds I seem to have a problem with the variables.. I've attached a screen grab.. could any one advice on how I should write that part? Submitted by Matt_2015 on Tue, 2017-03-28 08:22. Submitted by sable806 on Mon, 2017-03-27 02:01. Can you provide us the error that it returns. If i understand correctly you need to loop 5 time and each time assign random values to hair ? I think your error comes from the loop declaration. 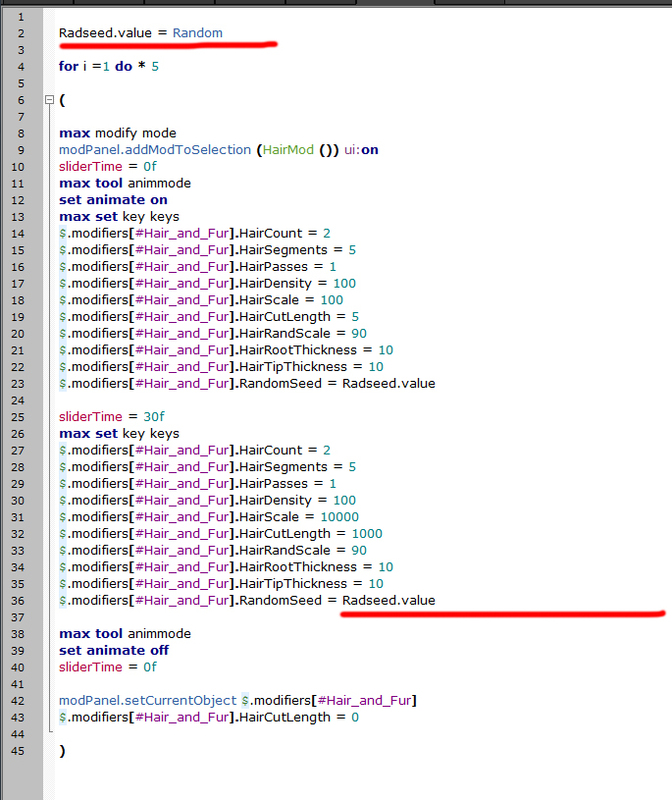 This is a working chunk of code that will loop 5 times before exiting.